Her Royal Highness Princess Soamsawali graciously presided over the opening ceremony of the 18th HA National Forum and bestowed Hospital Accreditation (HA) and Re-accreditation certificates to130 qualified hospitals. Her Royal Highness was welcomed and presented a hand garland upon her arrival by Miss Kornchaya Chawvorravinyoo, Public Relations Manager of IMPACT Exhibition Management Co., Ltd. 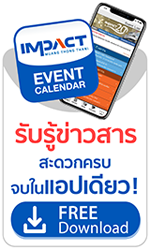 Organized by the Healthcare Accreditation Institute (Public Organization) during March 14 – 17, 2017 at Hall 9, IMPACT Forum, Muang Thong Thani under the theme of "Inner Power, Together We Can". ,the forum serves as an academic platform for healthcare specialists, hospitals and medical centers to exchange ideas and experiences in order to improve the quality of healthcare services within the country. The event also aims to recognize and honor healthcare providers that are active in quality improvement.